The fierce rivalries in motorsports has always been a key element in the most memorable eras. Richard Petty versus David Pearson, Ayrton Senna versus Alain Prost and even manufacturer face-off such as Ferrari versus Chevrolet are occasions in auto racing history where the presence of a full group of contentions is respectfully discounted to see a one-on-one match-up. While modern auto racing bodies are constantly trying to open up the playing field to an assortment of drivers and organizations, there continues to be match-ups where two figures become a prominent fixture. For the past two seasons in the IZOD INDYCAR Series, the Scottish driver for Target Chip Ganassi Racing #10 car and an Australian driving the #12 Penske Racing team have been the overall championship point duelers. In 2010, Will Power demonstrated some incredible magic on road courses in a first full season for Penske that allowed the Australian to contend for the series title against the more experienced shoe of Dario Franchitti. Franchitti's performance on ovals (a track layout understood to be shortfall for Power last year) gave himself and the Chip Ganassi Racing team the advantage for the 2010 series championship. In 2011, the battle between Power and Franchitti has apparently become a lot more directed. The focal point for their combat was the Honda Indy of Toronto where Franchitti's actions during the event sent Power's #12 around on course. Embattled in a see-saw battle through the 2011 IZOD INDYCAR season, Will Power and Dario Franchitti entered the Iowa Speedway race tied in the overall points standings after six events. Through unfortunate events at Iowa and Toronto for Power and the Penske Racing team, Franchitti built up a sizable points cushion only for Will Power to chip away at the lagging slowly. Helped largely by a 6th place finish at New Hampshire Motor Speedway following Franchitti suffering a DNF, Power would take the points lead following the Twin Ring Motegi road course event. Will Power's efforts were heavily set-back by a miserable outing in the past race at Kentucky Speedway where he finished 19th after a pit road accident damaging his race car. Entering into their second championship showdown, both drivers came from a background involving competition in Formula cars overseas only to be discovered in North America under modest circumstances. For Dario Franchitti, he arrived in the CART series in 1997 driving for Hogan Racing while Will Power was drafted by Team Australian/Walker Racing in Champ car in 2005. Considerable talents, the IZOD INDYCAR Series premium teams signed their respective drivers. Together, Franchitti and Power combine for 10 of the 16 races currently completed on the series schedule. 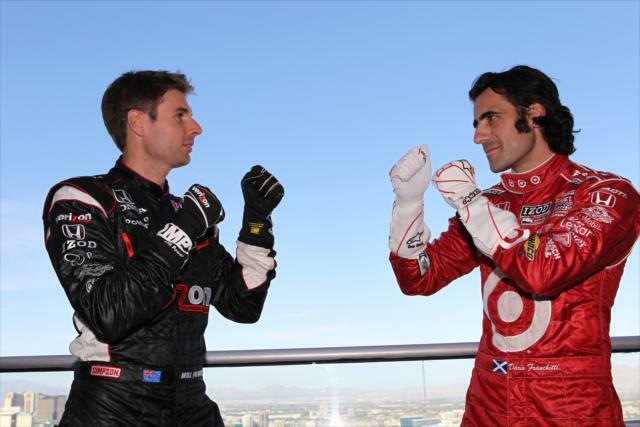 Taking their championship battle onto the 1.5-mile Las Vegas Motor Speedway oval, Dario Franchitti and Will Power arrive to the track that neither driver has competed on in the IZOD INDYCAR Series. On account of the last major open wheel event for INDYCAR was run at the track in 2000 (when the series was known as the Indy Racing League), the search for understanding of the oval could have contributed to the 18th and 19th place qualifying efforts Friday. Both drivers do process a vague interpretation of racing in the major Nevada city. Heading into the Las Vegas Motor Speedway, Will Power in fact has a winning history in the land famously known as 'Sin City'. In 2007, the Australian won his first major open wheel event in North America on the Fremont street course during an Champ Car event. In the case of Dario Franchitti, he raced the Las Vegas Motor Speedway during his 2008 foray into NASCAR. Driving in the Sprint Cup stock car series to a 33rd place finish, Franchitti also competed in the NASCAR Nationwide round taking a more optimistic 6th place. With an 18-point gap separating Will Power from Dario Franchitti, the IZOD INDYCAR World Championship race at Las Vegas will see if the score can be even in their series championship fight.